"This is it. Welcome to MTV -- music television, the world's first 24-hour stereo video music channel...Behold, a new concept is born: the best of TV combined with the best of radio. Your favorite tunes are never too far away any time you tune in...Right now, you'll never look at music the same way." Those were the words uttered by Mark Goodman on MTV's first-ever broadcast on Aug. 1, 1981. When the network launched, it ushered in the video era that would transform the music industry and catapult artists such as Michael Jackson, Madonna, Duran Duran and Prince to stardom. But aside from the videos, a huge part of the channel's early history was its on-air talent -- or VJs -- who for the first several years consisted of five personalities: Goodman, Nina Blackwood, Alan Hunter, the late J.J. Jackson and Martha Quinn. They presented the videos, conducted interviews, and delivered concert and music news -- and in the process became part of pop culture history. Now, four of the original VJs are telling their stories in a new book, "VJ: The Unplugged Adventures of MTV's First Wave," co-written with Gavin Edwards (The book is published by Atria, an imprint of Simon and Schuster, part of CBS Corporation). Dishy, hilarious, wild, and poignant at times, "VJ" offers a frank, behind-the-scenes look at what happened at the network on and off the set. It includes the VJs' recollections of the many rock stars they met; the excesses of the decade, from fashion to drugs; travels on the road and fan contests; and the impact that working at MTV had on the VJs' personal lives. "I want people to understand how much fun the decade was," Goodman told CBSNews.com, "how much fun the music was and to get a sense of what working in that kind of environment was about. None of us ever had a job like that since." It's easy to forget, because it's now a corporate behemoth, but at one time MTV was really just a start-up. "I thought, 'Gosh, this makes total sense: marrying the TV generation with the rock and roll generation,'" said Quinn. "But then of course, everyone said, 'Who's gonna watch videos over and over?' Nobody." "I went to this MTV thing because I thought, 'Well, yeah it seems like a cool idea,'" says Goodman. "'It'll probably be around.' None of us could have guessed. Even [MTV exec] Bob Pittman couldn't have guessed that it would become a cultural phenomenon. There was no way for us to know that in advance." MTV was so far from being a sure thing back then that the VJs and the rest of the crew traveled by school bus to a Fort Lee, N.J., restaurant to watch the inaugural broadcast on a TV screen -- cable wasn't yet available in Manhattan. "I had only been a part of the MTV family for a couple of weeks at that point," Quinn recalled of that night, "but there were people who have been there for years launching this rebel of an idea. I mean, people were like sobbing when that rocket went off, it was really an amazing night." Goodman added: "It was a big, big sigh of relief, yet at the same time a night where we went, 'Now we got to start feeding this beast.'" One of the revelations in the book is the resentment Goodman, a rock radio veteran who previously worked at New York station WPLJ, had toward Quinn and Hunter, two relative newcomers to the music scene. "Part of the reason for me wanting to do this book," he says now, "is that I feel really feel badly for a lot of stuff that happened in the '80s and that I was a part of. Part of it for me was to say, 'I'm not that guy, I'm sorry, I was swept up in the moment, and I feel really badly about it.' And that was an important thing for me." 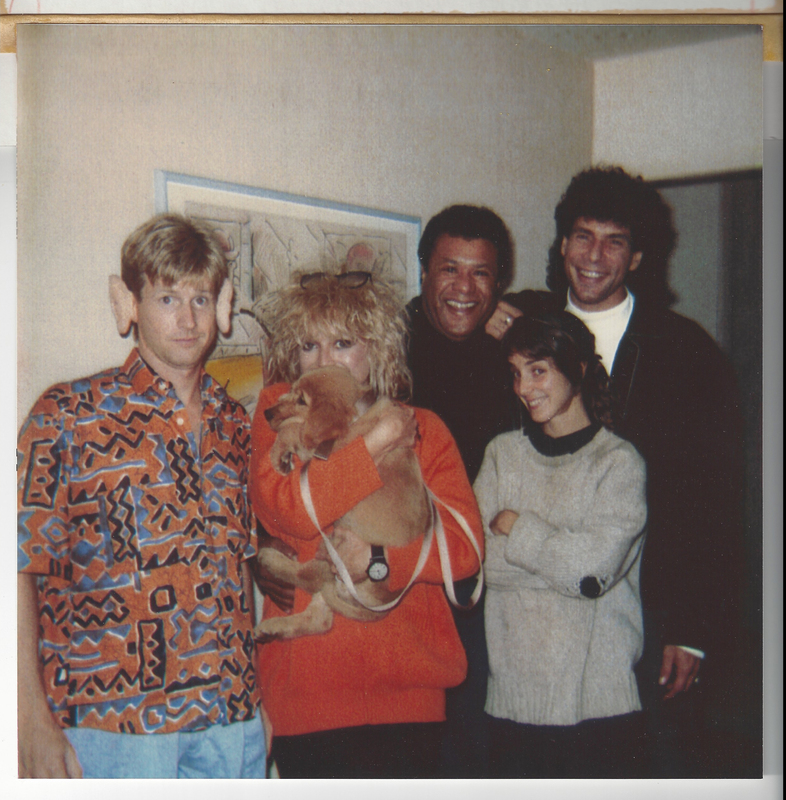 "To me, Nina Blackwood, Alan Hunter, J.J. Jackson and Mark Goodman were like the coolest people that I had ever met," said Quinn. "And I kind of felt like my mom had told my older siblings that they had to babysit me, because I got to hang out with them every single day, and it felt so cool just hanging out with them and I kind of felt cool by proxy." Another interesting fact revealed in the book: the VJs never actually watched the clips they were presenting, according to Quinn. "That's the best-kept secret," she said. "It wouldn't make sense for the camera people to turn on the camera for a total of six minutes an hour, and then to be sitting there watching [the rock band] Asia. It seems so obvious now, but it wasn't obvious to us at the time. We turned our heads as though we were looking at a monitor. We didn't do that in the beginning." Between them, Goodman and Quinn interviewed numerous rock stars for the channel, including Rick Springfield, David Lee Roth, David Bowie, Bob Dylan and Madonna. Goodman's favorite interview is the one he did with Paul McCartney in London around the time of the former Beatle's 1984 movie "Give My Regards to Broad Street." "We were told 'You got 15 minutes with Paul,'" Goodman remembers. "So we sit down and we're chit-chatting -- Paul and I -- and they were rolling tape on us. Behind Paul's back, I see his publicist running back and forth waving at me to 'stop, stop, stop!' I said in the interview, 'Paul, they want me to stop here.' And he goes, 'Oh, let's not.' And I was like, 'Paul McCartney wants to keep on talking with me.' It was one of those incredible moments." Quinn herself had interviewed many high-profile acts, but one particular conversation with the '80s band the Romantics didn't pan out well -- as she recalls in the book, revealing that the band was rude to her. At the time, Quinn was so worried that MTV would fire her if she didn't continue on with the interview. "To MTV's full credit," she said, "the executive, Les Garland, called me and said, 'Martha, you don't have to be in that position. You can end the interview in a situation like that.' Once I got that permission, then I was like, 'I wished I would have torn the mic off and said, 'This interview is over!' and stormed off or something. But I just froze." Clearly the artist who epitomized the golden age of MTV is Michael Jackson. But before MTV played his groundbreaking video "Billie Jean," there were accusations that the channel hardly aired videos by black artists. Quinn refutes the charge of racism. "Everybody who was involved in MTV was part of rock and roll radio," she said. "They were playing what was the rock and roll format of the era. ["Billie Jean"] didn't seem to fit the format and there was a struggle with that. Record companies or promoters go to bat for what they believe in, and they went to bat for Michael Jackson, and it turned out to be a benefit for all." In time, the VJs became as recognizable and popular as the rock stars they were interviewing on MTV. "It was fun and wonderful and exciting," Goodman said. "And I didn't realize the changes that I was going through until years later." "It was kind of wild," said Quinn. "I would go into a coffee shop and if I saw teenagers there, I'd kind of suss out, 'Okay, these kids might know who I am,' because I was part of the teen world then. Now I walk into a restaurant and if I see a guy who's kind of balding, striped T-shirt on, I go, 'Ah ha, that guy might remember me.'" By the mid- to late '80s, each of the original VJs began to leave the channel, beginning with Blackwood and Jackson, followed by the popular Quinn. "I really felt like I was going to be at MTV forever," she said. "'We're such a perfect fit.' I was completely wrapped up in the identity of my occupation. That was my whole entire life. So when MTV decided they weren't going to pick up my contract in 1986, it was like the world gave way beneath my feet. It was a really hard period of time." Goodman admits that he had regrets after leaving rather than take a pay cut. "What wound up happening is that I got bitten by the acting bug and that was also completely unexpected and it really also changed my life completely," he said. "It made me want to pursue that and I don't regret that either. They probably would have fired me in a year anyway because I was getting too old." Noticeably absent from all the reminiscing is J.J. Jackson, a larger-than-life rock radio veteran who died of a heart attack in 2004; the book is dedicated to him. "He was an amazing person," said Quinn. "When you lose one-fifth of the team, that's a really big hit. It's very sad that we don't have J.J. and I wished that we did." "I feel like we did a great job of letting people know who J.J. was," said Goodman. "He was the sweetest man in the world. We were all really sad that he wasn't around to actually do this with us. He was sort of the guiding spirit in a way as we were dong this [book]." The '80s are gone, but that decade is still a major part of the surviving VJs' current lives: all four host the "'80s on 8" channel on Sirius XM satellite radio. Meanwhile, MTV has shifted from playing mostly music videos to originally-scripted and reality TV programming in the last 20 years, most recently with "Jersey Shore" and "The Real World." "I always tell people, 'Look, even if MTV had never changed formats, if it was 24-hour videos -- it's not like they'd be playing Warrant and Spandau Ballet," Quinn said. "They'd still be playing Chris Brown and One Direction. People of our generation would still be going, 'It's not the same.'" "What's the point?" asked Goodman. "I think MTV as it was then was around today, it wouldn't be any reason for it to exist. We got VEVO, and YouTube -- whatever video you want, whenever you want, and as many times as you want. MTV has been shown to be pretty smart as far as that goes. There is no reason for that. It's not a bad or good thing, it's just is."